>3M Fastener MP3526N/MP3527N Hook and Loop S030 White - 1 in x 4.9 yds. 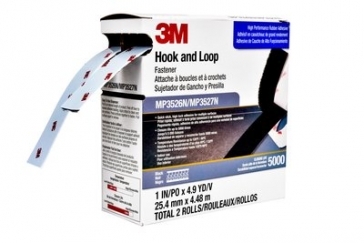 3M Fastener MP3526N/MP3527N Hook and Loop S030 White - 1 in x 4.9 yds. 3M Hook and Loop Fastener MP3526N/MP3527N is a best in class fastener that provides design flexibility and fast product assembly. With its high performance rubber-based pressure sensitive adhesive backing, this fastener allows for easy and convenient attachment to a variety of substrates, including plastics. 3M Hook and Loop Fastener MP3526N/MP3527N is designed to improve appearance, function, and productivity when compared to a traditional fastener. No drilling, no tightening. 3M fasteners offer greater design flexibility, faster product assembly, smoother and cleaner exterior surfaces and improved product performance in many applications. The hook and loop fasteners are coated on the backside with a firm synthetic rubber adhesive that performs well in many applications. This pressure sensitive adhesive is suited for attachment to a wide variety of surfaces, including low surface energy substrates such as polyethylene, polypropylene, etc. 3M Fastener MP3526N/MP3527N Hook and Loop S030 Black - 1 in x 4.9 yds.